Chicago and its suburbs host an array of influential “megachurch” campuses, each comprising congregations of several thousand members. 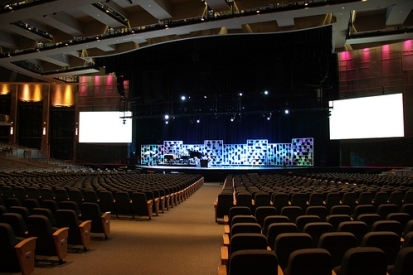 Willow Creek, Harvest Bible Chapel, Christ Community and others, attempting to attract unbelieving seekers and disenfranchised Christians, typically eschew in their services the elements of “old-fashioned” worship such as hymns, pews and traditional architecture, instead using praise bands, humorous skits and theater-style seating. A lesser-known megachurch, at least among Evangelicals, is First Baptist Church of Hammond, Indiana, located in the northwest corner of the state. Contrary to megachurch methodology, First Baptist doggedly maintains an adherence to revivalistic evangelism, the singing of gospel songs and an unwavering insistence on the King James Bible as superior to all successive translations. Founded in 1887 by Allen Hill, First Baptist grew steadily under a series of dedicated pastors, each contributing a unique strength. Notable among them was Dr. J.M. Horton, who served for fourteen years until resigning to lead the Indiana Baptist Convention. After Horton came Dr. T. Leonard Lewis, graduate of Wheaton College and Moody Bible Institute, who served for three years until resigning to assume the presidency of Gordon College in Boston. Then in 1944 came Dr. Russell Purdy, recommended to First Baptist by Dr. Will Houghton, president of Moody Bible Institute, and Dr. Harry Ironside, pastor of Moody Memorial Church. Purdy’s 1947 departure opened the way for Dr. Owen Miller, a supporter of missions and church plants. Miller served faithfully until 1958, leaving for Riverside, California; and again First Baptist sought a pastor. Several candidates interviewed with the trustees and deacons, but the most intriguing was a young Texas firebrand named Jack Hyles. As Keith McKinney and Gail Merhalski remark in The Old Church Downtown (2001), “Pastor Hyles’s preaching was different…Most of the guest preachers were serious, staid and stiff in their delivery…The most interesting pulpit supply were faculty members from Wheaton College…to put it mildly, most could not be heard above the occasional cough…Brother Hyles, on the other hand, preached!” Not surprisingly, Hyles was elected. In addition to breathing vigor into First Baptist’s evangelistic efforts, he promptly severed its ties from both Southern and American Baptist conventions, sensing an alarming drift toward ecumenism. 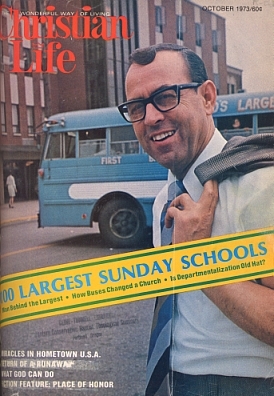 Under his leadership First Baptist’s various outreaches dramatically expanded; and in 1973 Christian Life magazine recognized it as conducting one of the “100 Largest Sunday Schools.” With multimillionaire contractor Russell Anderson, Hyles co-founded Hyles-Anderson College in Schererville, Indiana, in 1972. Ministering widely within Fundamentalist circles, he enjoyed a tight friendship with Dr. John R. Rice, founder and editor of The Sword of the Lord, located in Wheaton, Illinois. In 1960 Rice asked Hyles, who had been serving as assistant editor of the newspaper, to assume the editorship, providing that he resign and move to Wheaton. 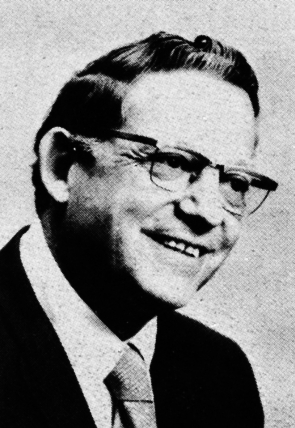 Hyles, reluctant to surrender his pulpit, declined and resumed his position on the Sword’s board of directors, while Rice in 1963 moved all operations to Murfreesboro, Tennessee. During the late 1960s Hyles spoke at Moody Founder’s Week in Chicago, Illinois, Rex Humbard’s Cathedral of Tomorrow in Akron, Ohio, and Oswald J. Smith’s People’s Temple in Toronto, Ontario. But as the years progressed, he limited his engagements, cautious of theological compromise. After Dr. Jack Hyles’s death in 2001, his son-in-law, Dr. Jack Schaap, was elected senior pastor. Each week First Baptist Church continues to operate a fleet of buses throughout Chicagoland and northwest Indiana. Matthew Barnett, pastor of Angelus Temple, founded by Aimee Semple McPherson in 1920, cites First Baptist as a model for urban ministry. The deportment of the sexes towards each other will he particularly regarded by the Faculty, and any student whose conduct shall be, in the judgment of the Faculty, either foolish or improper, will be promptly separated from the institution, if admonition fails to correct it. In short everything is forbidden which will hinder, and everything required, which, we think, will help students in the great object for which they assemble here, which is improvement of mind, morals and heart. The Faculty will exercise a parental and moral oversight of the character and conduct of the students, each officer having power to suspend disorderly students until next Faculty meeting. 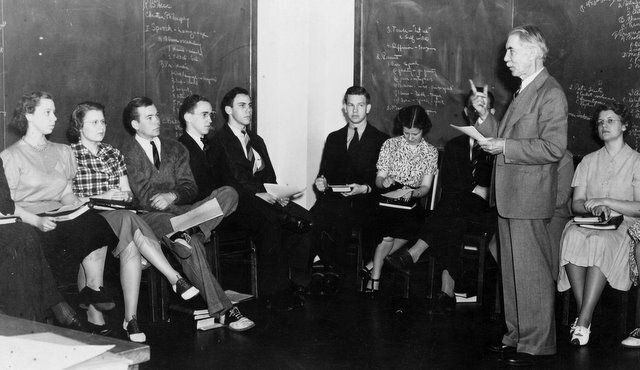 The students are required to be present at all College Exercises; to treat their officers with respect, and fellow-students with decorum; to attend church on the Sabbath; and not to leave town; or be out at night; or be out of their rooms in study hours; or absent from examinations without permission. 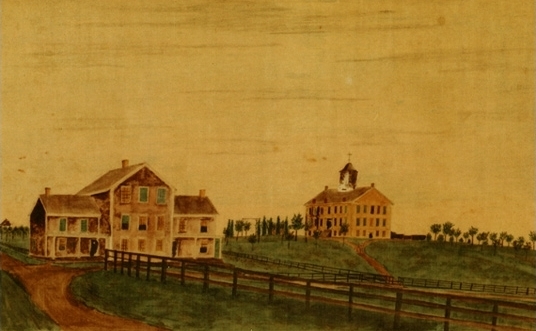 In the early years of Wheaton College, one could say in the early decades, as well, the college relied heavily upon the enrollment of local students. Though it broadly drew students from the region, it was the Wheaton community that served as the “bread and butter” of its tuition dollars. 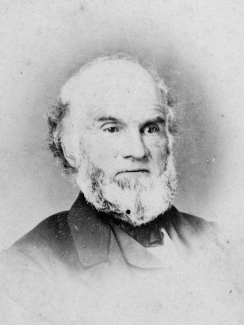 In 1860 the transition of leadership from Lucius Matlack to Jonathan Blanchard, from the full control of Wesleyan Methodists to the inclusion of Congregationalists, brought new energy and resources. It also brought a different perspective. For over one hundred years a member of the Wheaton College community could not be a member of a secret oath-bound society. Of any sort. The Illinois Institute and, afterward, Wheaton College were founded on several principles: abolition, temperance and anti-secretism. It was these last two, in tension, that brought forth Wheaton College’s encounter with the Illinois legal system. Edwin Hartley Pratt (1849-1930), a local student, was enrolled in the Academic program at Wheaton. He and several other students joined a local Good Templar’s lodge. Known officially as the Independent Order of Good Templars, this fraternal organization stood for many of the principles that Wheaton, and Jonathan Blanchard, held dear: equality for men and women, racial non-discrimination and temperance. It’s motto sounded very good and biblical — “Friendship, Hope and Charity.” However, it was still a secret society and Jonathan Blanchard would have none of it (having believed that the slave system was the work of secret societies). So, the administration of Wheaton College (i.e. Jonathan Blanchard), tossed out Pratt and his co-secretists. In response Pratt’s father sued Wheaton College under the belief and assumption that his son had done nothing illegal and therefore could not be expelled. A legal battle (Pratt v. Wheaton College) ensued that made its way to the Illinois Supreme Court. In a precedent-setting decision the Illinois Supreme Court upheld the right of Wheaton College, and any other school, to establish rules to govern the lives and discipline of its students, much in the same way that a parent would. As the ruling stated, “A discretionary power has been given, … [and] we have no more authority to interfere than we have to control the domestic discipline of a father in his family.” This firmly established the principle of in loco parentis. In loco parentis is the legal doctrine that outlines a relationship that is similar to that of a parent to a child. 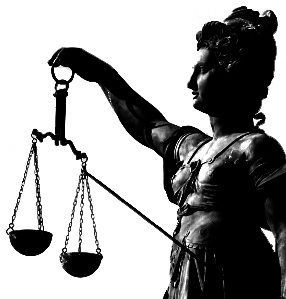 The concept goes back hundreds of years and was embedded in English common-law that was borrowed from by American colonists. The Puritans put this idea to use and it found its way into American elementary and high schools, colleges, and universities. 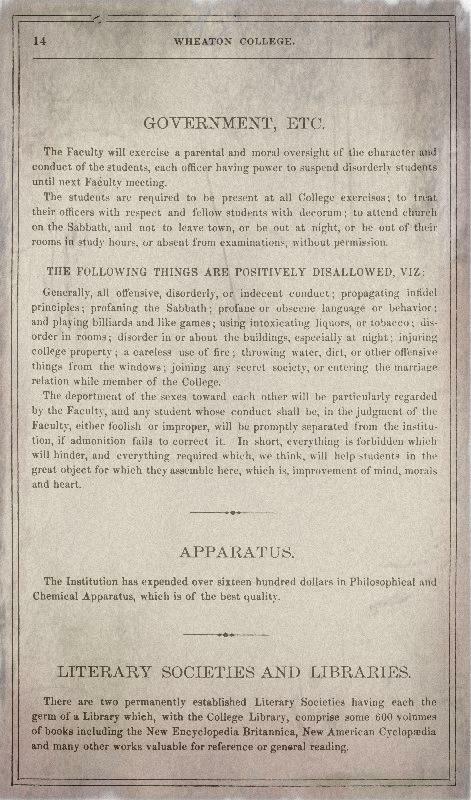 The legal system in the nineteenth century was unwilling to interfere when students brought grievances, particularly in the area of rules, discipline, and expulsion. However, this would change in the 1960s as all forms of authority were challenged. One may wonder what ever happened to Pratt. After leaving Wheaton, he became a noted homeopathic physician and surgeon in Chicago and was known for his professional writing and work. He wrote Orificial Surgery And Its Application To The Treatment Of Chronic Diseases (1891 and dedicated to his father) and The composite man as comprehended in fourteen anatomical impersonations (1901 and published in several editions). He served as President of the Illinois Homoeopathic Medical Association and served on several medical boards and commissions. In 1877 he married Isadore M. Bailey (a Wheaton student from 1875-1877) with the Rev. C. P. Mercer of the Central Swedenborgen Society officiating. Pratt joined the Chicago Society of the New Jerusalem (Swedenborgian) in 1881. Oddly enough, Pratt v. Wheaton College wasn’t the only time that Pratt was before the Illinois Supreme Court. In 1903 Pratt was sued for not gaining consent before conducting a hysterectomy on a mentally-ill patient. Pratt lost the case and was fined $3,000. He fought the ruling seeking redress before the Supreme Court. Yet, again, the court failed to rule in his favor. 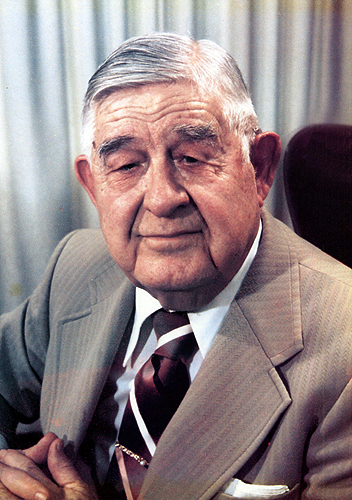 Dr. Richard E. Eby, obstetrician and gynecologist, was co-founder of the Park Avenue Hospital in Pomona, California, and served as the Executive Assistant of the American Osteopathic Association in Chicago, in addition to serving as the charter President of the Osteophatic Physicians and Surgeons of California. Born in 1912 among the rolling hills of western Massachusetts, he enjoyed a normal boyhood, raised by godly parents. However, in Eby’s case the ordinary was frequently absorbed into the extraordinary, establishing a peculiar standard of supernatural activity throughout his long life. In his autobiography, Caught Up Into Paradise (1978), Eby chronicles at least one miracle per chapter. The first occurred at his own premature birth. As his nurses, fully expecting him to die, tended his feeble body, Eby’s mother heard Jesus whisper: “I am giving your tiny boy back into your care…I am still the resurrection and the life.” To the astonishment of all, baby Richard recovered; and a week later he went home. Yet another miraculous instance manifested when young Eby left his pet chicks outside during a cold night, inadvertently freezing them to death. Saddened, he breathed his own warm breath on their stiff bodies and placed them on a biscuit tray, sliding it into the oven. A moment later he opened the door to find living, chirping chicks. As a student in 1931 at Wheaton College, he and others prayed round-the-clock for the financially depleted school, nearing closure during the Depression. Against all odds it remained triumphantly open as the students worked their way through, contributing to its operation. At Wheaton he also met his future wife, Maybelle. But the miracle that forever changed Eby happened in 1970. Leaning against a railing at a Chicago apartment building, the support gave way, plunging him two storeys, landing headfirst. As his mortally injured body was loaded into an ambulance, Eby awoke to “the most exquisite place,” entirely without shadows. Fascinated with his ethereal, white-robed body, he excitedly explored this luminescent realm with its indescribable music and exotic fragrances. But the vision did not last. He opened his eyes to excruciating pain, lying in a hospital bed, there to be told by Jesus from a glowing cloud floating above that Eby would now begin a healing ministry. Recovering fully, he visited Jersusalem in 1977, where he again saw Jesus as He appeared to him in Lazarus’s tomb, stating that, whereas Eby had seen Heaven, he would now see Hell. “You must be able to tell them,” said Jesus, commissioning Eby, “they can choose between heaven or hell, but tell them that I died to close hell and open heaven just for them.” Suddenly he was transported, and for the next two minutes he endured the horrors of the netherworld, its cold, rot and isolation. As a result of this startling visitation he traveled the world with Maybelle, proclaiming God’s grace and healing power. Further exploits are recounted in Tell Them I am Coming (1980), detailing Richard Eby’s national exposure from frequent appearances on Jan and Paul Crouch’s Trinity Broadcasting Network, and the attention generated by the miracles, physical and spiritual, that accompanied his encounters with the sick. Controversially, Eby was informed during a vision that Jesus would appear during his lifetime, which obviously did not transpire as of his death in 2002. When Jonathan Blanchard arrived in Wheaton in December 1859, he came alone. Mary, his wife, and family remained in Galesburg until the circumstances in Wheaton became more certain. Though the financial footing of the Illinois Institute was rather shaky, Jonathan Blanchard’s vision of what could be (and what actually was) was much more firm. 2. Make your donation of each alternate lot of that land an outright donation to the College. The College is already a fact and can no more be a failure than your farm can. It may yield more or less in any one year but it will be there. Jonathan Blanchard had an unwavering confidence in the purpose and goals of a college established For Christ and His Kingdom. The following comments by Charles Blanchard, who would have been 12 years-old when his father, Jonathan, assumed the presidency in 1860, are taken from David Maas’ Wheaton College Awakenings, 1853-1873. “That fall  I entered the academy, and my father being president of the institution, of course I was in touch with all college affairs. The home in which we lived was a small house one block south of the southwest corner of the campus, now owned and occupied by Mr. E.P. Webster, an alumnus. It is, as all who know it will remember, a very small house. My father had his study in the college building. There was only one building then and it was a very small part of what the central building is now. My father’s study was in the southwest corner. On the floor there were four class rooms. The college library was in my father’s office, and there was ample room for it there. I remember that when I was a child my father frequently wrote very late at night and that a light from his office window shown out in the dark. “We, that is, the family, arrived in Wheaton on an April day in the year 1860. The thunder of the guns about Fort Sumter was only a year away yet there was no hint of that dread concert in the air or the earth of that April morning. As already intimated the town was unspeakably dreary. The cold damp of the spring rains, the low marshy grounds the inferior huddle of houses, the single college building standing alone in the midst of its campus, the boarding house at the foot of the hill, cheaply constructed altogether was wearisome and dreary. 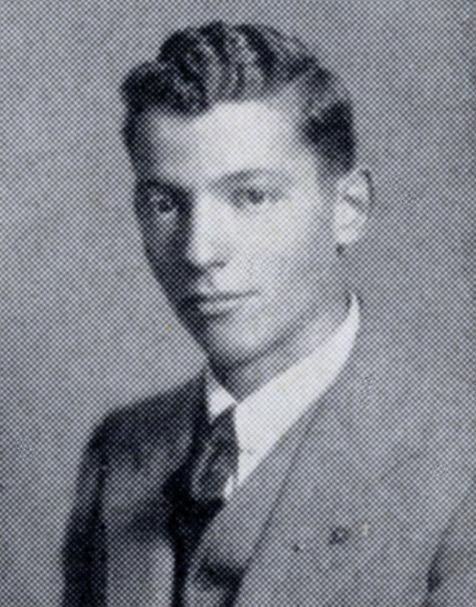 In his memoirs The Wheaton I Remember, Edward “Coach” Coray (Professor Emeritus and former Executive Director of the Alumni Association) recalls his first days as an undergraduate student at Wheaton College in the Fall of 1919. Our first class was rhetoric and we sat in chairs around the sides of the room. Professor Straw took roll peering at each student over the top of his glasses. Then he read Scripture and offered prayer. Next he startled a member of the class by calling on her to sing a hymn. In the days which followed members of the class read Scripture and offered prayer and each took his turn at singing. From an aesthetic standpoint the music was not always top quality. The first day’s devotions having ended, our teacher instructed us each to take a section of the blackboard and summarize the first chapter of the text. My friends and I kept our seats. Professor ambled over, faced us, looked us over and said, “What’s the matter with you boys?” We explained to him that we had tried to buy textbooks but the supply had run out, that we did have a real thirst for knowledge and that the situation was one which caused us much sorrow. Rather than bring tears to his eyes Prof gave us a cold look and said, “Shame on college men who are not more resourceful than that. You should have borrowed a book or used the one in the library. Zeroes for each of you.” Whereupon he took his gradebook, made sure of our names and started each of our college careers with a big fat zero.